Before the Internet, on-line networks were beginning to grow in popularity such as Compuserve, Delphi, and GEnie, we recognized a unique marketing opportunity. Most companies were attempting to keep people from copying their software. We decided that we would take the opposite approach, creating a piece of software that would encourage copying and distribution. This would be a sample of our services as well as a vehicle to carry our logo out into the digital universe. This would also build name recognition for a later commercial release. We figured that a game would be the perfect vehicle for such an endeavor and the award-winning DreamLight Verttice is the result of these efforts. 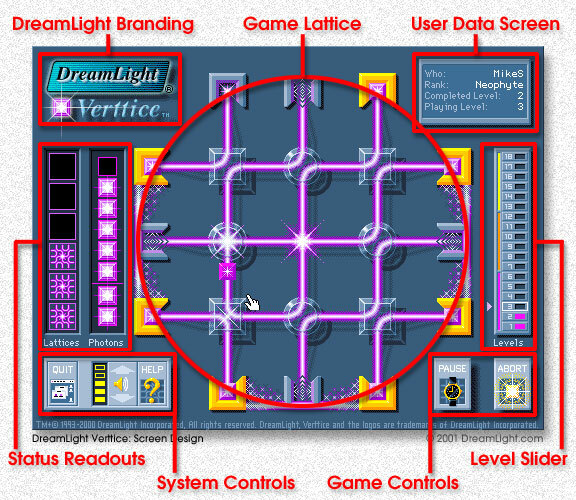 The award-winning DreamLight Verttice is a mesmerizing game of skill and strategy. Race against time to contain a laser light reaction. Transfer photon energy from the central reactor node through the ever changing laser lattice to waiting power nodes. Use your wits and reflexes as you struggle to prevent the lattices collapse. There are 108 laser lattices of increasing difficulty. During the development of our DreamLight Autiton, intelligent interactive characters, which can now be seen on Quipples.com, Telebites.com and Autitons.com, we were searching for something fun to play with them. We initially thought of playing standard childrens games like Tic-tac-toe, Boxes and maze games, but quickly decided to come up with our own, original, game. Thus, we set out to design a new game that captured some of the best elements of these traditional games. We started with a Tic-tac-toe board. We explored the possibility of movement among the positions rather than simply marking the positions. We then redefined the grid based on the possible movements. We were now encouraged by the possibilities. We had captured the feeling of several childrens games such as mazes, Boxes, and Tic-tac-toe We now needed a mechanism for deciding what paths would be taken. We wanted something extremely simple. One simple device that could be combined into complex combinations. We felt that the strength of mazes, Boxes and Tic-tac-toe was in this very simple rule, that a simple device can give rise to complex combinations. In Tic-tac-toe you can only draw a mark in a box. In Boxes you can only darken a line segment. In a maze you can only follow the path, turning at intersections. This led us to come up with the idea of putting switches in the grid at the nine original Tic-tac-toe positions. They can be in either of two positions and all you can do is flip them. Now we had that very simple device we were looking for, that would allow complex strategies through different combinations. This ground work gave rise to our first artists concept sketch of the board. This strong basic functionality survived through many variations on the theme and can be seen in the final game DreamLight Verttice. This is the first artists concept sketch in Macromedia FreeHand. We were initially exploring the title Vertigo but found it was already overused and so we came up with the new name, Verttice, based on vertex and lattice. DreamLight Verttice is an example of our multimedia interface design. The game screen is composed of custom designed, interactive controls and indicators. They are organized around the Laser Lattice in a manner similar to an automobiles controls around a steering wheel. A unified identity was carried throughout Verttice, from the interface to the custom icons. DreamLight has extensive experience designing program icons and has designed icons for such well known products as Macromedia FreeHand, Director and Extreme 3D. Even though there are programs specifically designed to create icons, we find Macromedia Director to be our favorite program to use for icon and screen design. Some of the features, like custom palette manipulation and switch ink effects, are invaluable when designing screens and icons. We like to spread out on a cast member page and paint away on many variations of an icon. We even went so far as to design DreamLight PixelPalettes for use in Director during icon and screen design. DreamLight PixelPalettes are available right here on the DreamLight WebSite. They are one of many web design and multimedia items that can be found in the DreamLight WebShop. Most of the interface artwork and animation for DreamLight Verttice was created directly in Macromedia Director using the DreamLight PixelPalettes as the above icons were. Run the opening splash logo animation in Shockwave. This sequence was created using Macromodel, Macromedia Three-D and Adobe Photoshop and has been used as an opening for DreamLight Verttice as well as for the KeyQuest CD-ROM which DreamLight also created.